What Happened to the fake mustache, no pants guy? 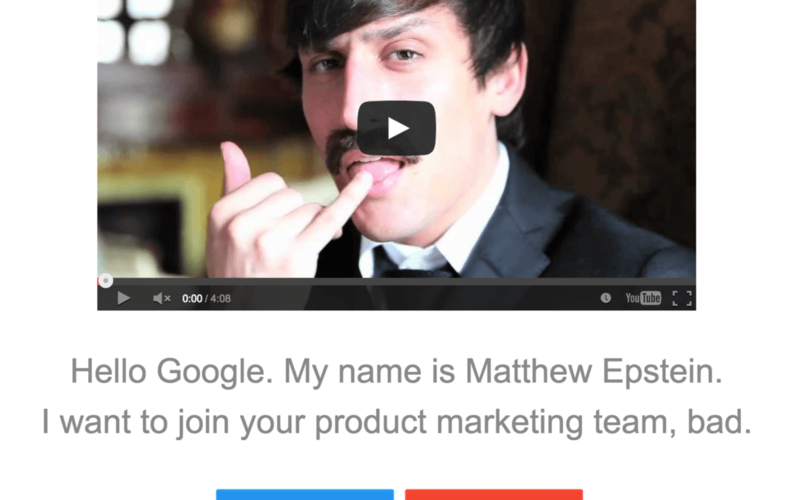 Ever wonder what happened to the fake mustache, no pants guy who waged a 'Google, Please Hire Me' campaign to get a job at Google? We did.Click To TweetEver wonder what happened to the fake mustache, no pants guy who waged a “Google, Please Hire Me” campaign to get a job at Google? Back in 2011, Matt Epstein waged a guerrilla marketing campaign targeting Google as his next employer. To this day, the innovative campaign serves as a case study on how to get a job by making a grand gesture. While one can always respond to job postings, you may not always learn of the most attractive job openings. In fact, research has found the Google Ad platform offered men ads featuring better jobs opportunities. Matt did not wait for a job opportunity to find him online. Rather, he turned the process on its head. Matt set up a website that spoke to Google and Google alone. To leave no doubt as to the purpose of the website, he selected the domain name googlepleasehire.me. Next, he created a video where he adopted an intentionally cheesy persona along with a fake mustache. In the video, he appears without pants in his boxer shorts. He brought it all home in the video by allowing us to meet the real Matthew at the end. Matt’s experiment worked. It went viral. In the Internet world, that’s not an easy thing to do. Some would argue that accomplishment alone qualified him for further scrutiny as a marketing candidate. His innovative method of applying for a job demonstrated he can write and market effectively with few resources at his disposal. Moreover, his effort demonstrated he is creative and that he is willing to go-for-it and risk possible failure. Matt’s “grand gesture” is a tried and true device that has been used by some of the most successful people in the business world. Donny Deutsch, one of the most successful CEOs in advertising history used it to capture clients. Donny is reported to have sent car parts to the home of the Pontiac rep to land an account with Tri-State Pontiac dealers. He sent a fender with a note that read, “We’ll cover your rear end.” Donny won the account, doubling its size. So What Ever Happened to Matthew Epstein? Matt Epstein became an Internet sensation. If you Google the name of his campaign, it returns more than 25-thousand pages. He made the evening news on network television. In fact, news organizations around the world covered the story. #GooglePleaseHireMe took off as a Twitter hashtag. Like hashtag gurus Jimmy Fallon and Justin Timberlake, Matt was an early mover on the use of hashtags. Perhaps, the biggest accomplishment was being featured in an article of AdWeek, a marketer’s dream. So Who Ultimately Hired Him? Ultimately, Matt accepted a job at a financial services startup called SigFig where he stayed for 2 years. Next, he took a job as employee number #1 at an HR benefits startup called Zenefits. There, he ultimately became CMO, helping grow revenue to $60MM+ ARR and the company to 1,000+ people. While at Zenefits he built and managed a team of 24 marketers. He also created a sophisticated lead gen machine that fed 300 + sales representatives. Matt’s LinkedIn profile indicates has left Zenefits a year-and-a-half ago. I’ve reached out to find out what he is up to these days and to discuss lessons learned along the way. But I’m guessing Matthew is looking for his next gig. Naturally, I wonder what he might do to top his earlier effort.